TEN has been screening a number of David Attenborough series recently, including several we’ve seen before elsewhere, but next week it unveils an Australian premiere series, Africa. This premiered in the UK in January and will launch here Saturday February 16 at 6.30pm. Africa consists of 5 episodes, to be followed by The Making of Africa and The Future of Africa. Call me crazy but I can’t help but wonder if it would yield TEN bigger numbers on another night? In this blockbuster series, the BBC’s Natural History Unit reveals Africa as you’ve never seen it before. This is a journey through five extraordinarily diverse regions of an amazing continent, packed with new stories, new species, new places and a new style of storytelling. Taking you seamlessly from the wild terrain of extraordinary landscapes to intimate encounters with its mesmerising creatures, this is a unique expedition to the most extreme parts of a vast continent. From the beauty and serenity of the soaring Atlas Mountains to the Cape of Good Hope, from the brooding jungles of the Congo to the raging Atlantic Ocean, experience unexplored rainforests, never before filmed mountain ranges and even snow-covered desert. Get eye-to-eye with unknown species and become re-acquainted with some of the planet’s best loved animals, behaving in ways that very few have ever seen. 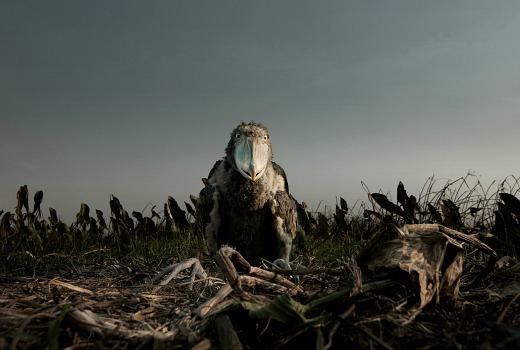 As the dynamic tension between wilderness and wildlife plays out, the drama, beauty and power of this majestic land is revealed: prehistoric-looking shoebills fight for ascendancy, plucky lizards playfully hunt for food on the backs of their formidable feline companions and giraffes engage in ferocious battles. The series trades on ‘newness’, the filming style takes you ‘out of the 4 x 4’ offering truly intimate, eye-to-eye encounters with extraordinary wildlife. Along the way we explore five diverse regions of wild Africa packed with a fresh sense of personality and venture into genuinely unexplored places to capture never seen before behaviour, even of the most familiar wildlife. Seriously people did you really think TEN would put a new high profile show like this on ONE? Also the majority will not buy shows on BluRay just to see it in HD with no ads. Now it would have been good to see this series in HD either simulcast or some time within a week of the original air dates but that could also erode the viewing audiance totals for the original. As for showing it on Saturday nights. If you don’t like that then buy a PVR and record it, watch it when you like. Oh dear, TEN gets it wrong again! Wrong night and I can’t believe it’s being squandered on a SD Channel – such a natural fit for HD. I’ll be waiting for the Bluray. Again, Ten squandering perfect HD broadcast content on a SD channel… I’ll wait for the Blu-Ray – its out March 27. Why don’t they use ONE where at least this series will look great? On an SD channel with commercials just cheapens the whole thing. @tomothyd – maybe that explains it, TEN will drop the last 10 min BTS, I think ABC did that once for a BBC show. So 1 hour will work, just. They will probably fudge the time and shows after it will start 5-10 min late. I agree this should be in HD and re-aired the same week on ONE HD. Watching this type of program in SD is a complete waste of time. I agree with Saturday night I feel it could be a good lead in to Elementary……just thinking out loud. Saturday night is not a good night for TV at all. The problem is that Africa doesn’t fit in with Ten’s strategy of going after younger viewers starting with The Simpsons at 6pm. So they are using Africa to pick up a few older viewers on Saturday night when they aren’t doing anything else. It is where they have been screening other Attenborough documentaries and getting 500k with repeats. Oh well at least it’s something of quality on a usually barren night. Sir David Rabbitborough could create 5 x 1 hour specials about paint drying and it will be insightful, well scripted, beautifully filmed and a pleasure to watch. Personally, I don’t care what time Africa is on, or which channel or which day, or what competing channels throw against it, I will watch Africa. It must be a programmer’s dream to have access to Rabbitborough’s works. Btw, the ‘Rabbitborough’ tag is an old joke and used with the greatest respect to the man. @Craig – a look at the guide shows that it’s an hour slot. @tomothyd – I suspect that you’re right – there is no episode called “The Making of Africa” so this will prob consist of the various making-of segments edited together. However, I thought that the program ran to nearly an hour with the segments, and therefore a little under 50 minutes without. I was really looking forward to this but like all Attenborough’s shows, this deserves to be see in HD, so I’ll be giving it a miss on 10. The blu-ray is released on the 18th. Day one purchase for me. Agree completely about airing it on a Saturday. This is a spectacular show with brilliant footage. It’s a shame it will be shown on SD and with commercials. The episodes in the UK run for 50mins, with the final 10 mins being a brief behind the scenes look at how they captured the footage for that particular episode. I am expecting that TEN will not show the final 10 mins, reducing the length to 40 mins allowing for commercials and a 1hr broadcast block. Just wondering David, this like a lot of BBC programs runs a full hour for each part, will it be edited or will it run 90 min on TV with ads?